We don’t do Easter Baskets. I know that some people may be bothered by that, but guess who isn’t: Our children. So, if you are reading this as a young parent and you don’t have massive gift-giving traditions in place, take some advice: don’t start them. The easiest thing as a new parent is to start out gifting simply. Of course, we want to lavish our children in gifts, it’s fun for us! But as the years go by and more and more clutter builds up in the children’s room and overflows through the rest of the house, it gets overwhelming. So if you are at the beginning and have the opportunity to set the tone for the rest of the gift-giving days of childhood: keep it simple. Now, if your children are older and accustomed to getting large Easter Baskets of goodies, there is still hope! Start off with talking to your kids about your thoughts and what they can expect. Experience gifts are the most clutter-free gifts that you can give. Give tickets for a concert, sports events or a special movie they’ve been wanting to see. Go together. Spending time with your children is the best present you can give. For our family, we have Easter traditions that don’t involve gifts. The older kids have never complained, the younger ones don’t know any different. To them, Easter is very exciting! In the morning we attend church, read over the resurrection story from the Bible with the kids and talk about how amazing it is that God would prove His love to us and how we can trust Him in such a way. 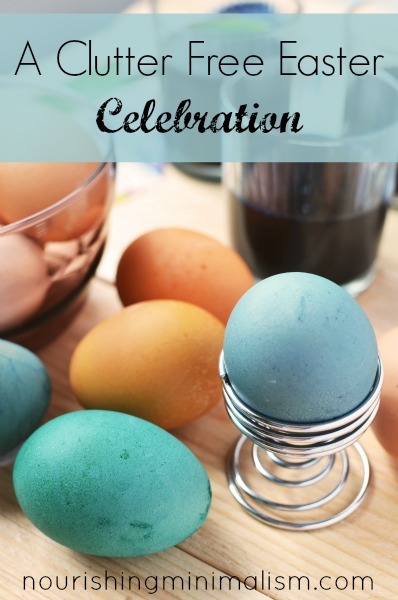 In the afternoon, Grandparents join us for a meal, where we crack red eggs together (this is seriously their favorite tradition of all the holidays), we always eat Greek Easter Bread, and yes, they do get chocolate from grandma. Then Dad and the older kids hide eggs. We pack the eggs with coins rather than candy and once all the eggs are found, the kids sit and count the money before putting it into their piggy banks. One year I split up a Lego set and put it in eggs, which worked great, except for the lego pieces I found the following year when I pulled out our plastic eggs again (we reuse the eggs every year). It’s really quite a simple holiday for us and we all enjoy it. How do you maintain a clutter-free Easter holiday? That’s great to have useful items in there, I don’t blame them for not wanting to give it up! Definitely a good option for those who need to/or still want to do baskets. Thanks Jill. I’ve never heard of Easter baskets being a thing before, at least not ones with stuff rather than eggs. As a kid we always had chocolate eggs, sometimes in a container of sorts in our room or hidden around the house. I’ve always hidden them for my son, spending a few minutes letting him search and then starting warmer/colder for the tricky ones. Zero clutter, small amount of rubbish. I have to admit I was shocked during one of my firsts Easter’s as a parent to see my fb news feed filled with my peers giving over the top (imo) baskets for Easter. It was not like that at my house growing up at all so I was confused. Easter was mostly a bit of candy and a small toy. I stick with a new Easter dress (which adds to their church clothes for the year). When we lived in the UK there was a Christian charity that sold chocolate eggs and they had a great booklet inside about the real meaning of Easter. So they got a chocolate egg, some jelly beans and then usually a book which talks about Jesus and the meaning behind Easter. So far we have stayed clear of gifts since the greatest gift of Easter is Jesus. Now that the girls are old enough we will probably make Empty Tomb cinnamon rolls. I do love our actual Easter baskets though. They are pop up so during the rest of the year they are easily stored flat. Do you have a recipe for the empty tomb cinnamon rolls? Tell me more, please. Check allrecipes.com for resurrection rolls. Or do a google search resurrection rolls. Love this! Now to get my extended family on board! Every holiday or family get together is an excuse to give my 2 year old gifts. He is the only grandson on my husband side of the family and the baby of the family on my side of the family. I’ve told the families many times how we want to live more simply, but it hasn’t worked. I usually end up donating or returning the things they give me. Any advise or previous articles that addresses this or that I could send their way? Thank you!!! Hope they give some help! The tradition on the Isle of Man is to have contests to see whose decorated boiled egg will roll the farthest down the hill. Seriously we take a picnic to the park with other families and chuck eggs down the hills. The birds and the kids love it. We also have an egg hunt in our living room with little chocolates and Marzipan. I hate storing the little plastic eggs every year so we make little bunny containers out of half a toilet roll. When the day is done the bunnies are recycled, marzipan is eaten and the chocolates are mostly forgotten about. Cat, I would love to hear how you make your toilet roll bunnies. I have been using plastic eggs so I can buy bulk vegetarian jelly beans to hide (and produce no waste), but I would love to not have to store them or use any plastic at all. The egg hill rolling idea is fantastic, but i am not sure the weather in Canada will work for this as it is usually cold and mucky, SOMETIMES A LITTLE SNOWY. I think i might tRY TO give it a go with my l.o. next year anyway! We’ve lately coloured eggs with natural dyes that we’ve made from BOILING whatever we have at the time (cabbage, coffee, beets, onions ETC,). The process of seeing what colour they will make is half the fun! eVERYTHING IS COMPOSTED AFTER, EGGS ARE EATEN AND THERE IS NOTHING TO STORE! Also, accidentally hit the all-caps. Sorry, I Didn’t mean to yell those lines! We sat down this year and talked with our kids (ages 13, 10 and 9) about what they want vs. what they need. As a family, we decided to plan a family day to a local aquarium. We’ve been putting this off for a few years because of the expense, but those Easter baskets added up, too. We are really looking forward to this time together, and making memories as a family. Great post Rachel! No Easter baskets for us this year either…going on a family vacation and spending quality time together over Easter. My favorite gift is the gift of experience! At our house we do an activity that our kids would be sad to see go because they think it’s so much fun even when they’re pushing 20! I hide plastic eggs (that are color coded for each child) that each have a paper piece with a single letter written on them. They have to find all the eggs first, unscramble the letters which tell them where their gift is located. For example, “pantry” etc. Then they have to search further for their gift, which is usually around $5 of Easter treats. Our church has an Easter breakfast followed by a Resurrection service. And yes, they love to sit around the tables catching up with their friends as well! Later we go to grandma and grandpa’s farm for a family gathering. I know I’m late to this party, but I really love what you’ve said here. We fill hollow eggs with paper confetti and the kids smash them on each others’ heads, after the egg hunt. The paper decomposes in the yard. I give them an Easter basket every year, with another hollow egg that I have filled with melted bulk chocolate (I bake it first, to make sure it’s sterile), coupons good for getting out of chores, new tights, fun socks, and seasonal needs/wants. One year it was gloves for Easter service. I don’t use special baskets, just ones we use around the house. I really love reading everyone’s ways of celebrating. I especially like the egg rolling — if the weather cooperates, we might try that one here this year. We usually give beach buckets, sidewalk chalk, stuffed animal bunny, and chocolate bunny. I usually toss out the bunny from the year before, but this year I’m skipping the stuff animal. They do add to the clutter. I like the book idea.